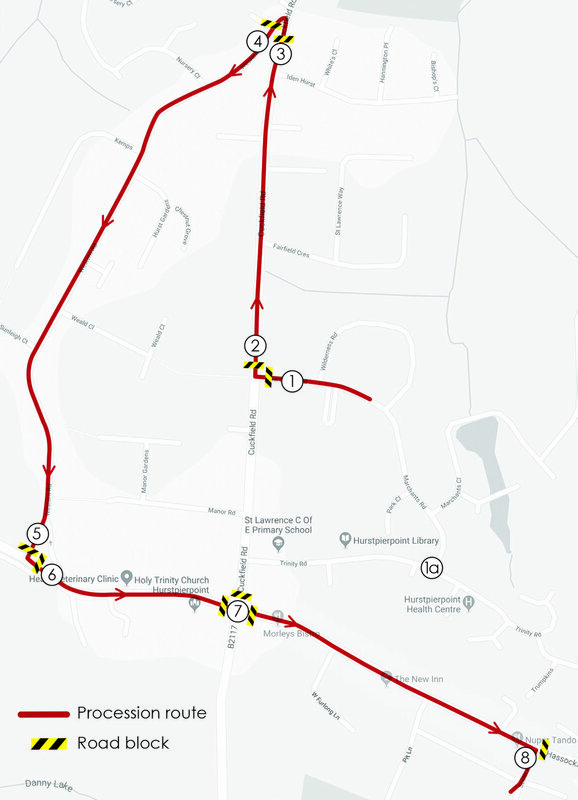 We thought it would be advisable this year to give all residents within the procession route, fair warning with the road closures on the day of the fair (Saturday 30th June 2018). The signs will go up with advance warnings, however what these won’t say is that we actually have them on a ‘rolling’ closure. Here we will try to explain and give timings as best we can, however please bear in mind these are approximate. 1. Procession starts from Marchants Road at approximately 1pm, however groups start assembling from about midday. Access to all side roads off Marchants Road will be from the Trinity Road end (marked 1a), but will be blocked at the Cuckfield Road end from 12.30pm for safety reasons. Once the procession has cleared Marchants Road, this road block will be removed. 2. & 3. Cuckfield Road between these points will be closed from 1pm, until the procession makes it way up Western Road, at approximately 1.15pm. As soon as the whole procession is on Western Road, these road blocks will be removed. 4. & 5. Western Road will close between approximately 1.15pm and 1.50pm. The procession stops for a break at point 5. at 1.30pm for 15 minutes. It will then move onto the High Street and once cleared, Western Road will reopen. 6. 7. & 8. As soon as the procession reaches the High Street at approximately 1.45pm, this road will then be closed. Cuckfield Road at point 7. will temporarily close to allow the procession to move across the roundabout. As it moves along the High Street, road blocks 6. & 7. will be removed. The procession will reach South Avenue Recreation Ground at approximately 2pm, and once all safely in, the High Street will reopen. We move at the speed of the slowest walking group and stop quite often along the route. We ask that everyone who lives or parks on the route to please try and find other parking temporarily so that our vehicles can get through pinch points easily; think of them as wider than a fire engine. The Round Table do a fantastic job of letting traffic through on the route until the last possible moment that roads need to be closed, but we can only man main junctions. We may ask you to pull in and park if necessary as side roads cannot be manned, e.g. off Western Road. Many thanks for your co-operation and understanding. We hope you enjoy watching all the amazing walking and motorised floats!